Climate : The majority of the country has a cold or severely cold winter climate, but southerly areas are warm in summer. Government: The Government of Canada or more formally Her Majesty’s Government, is the federal government of Canada, a country in North America, composed of 10 provinces, Ottawa (the nation’s capital), and 3 territories. 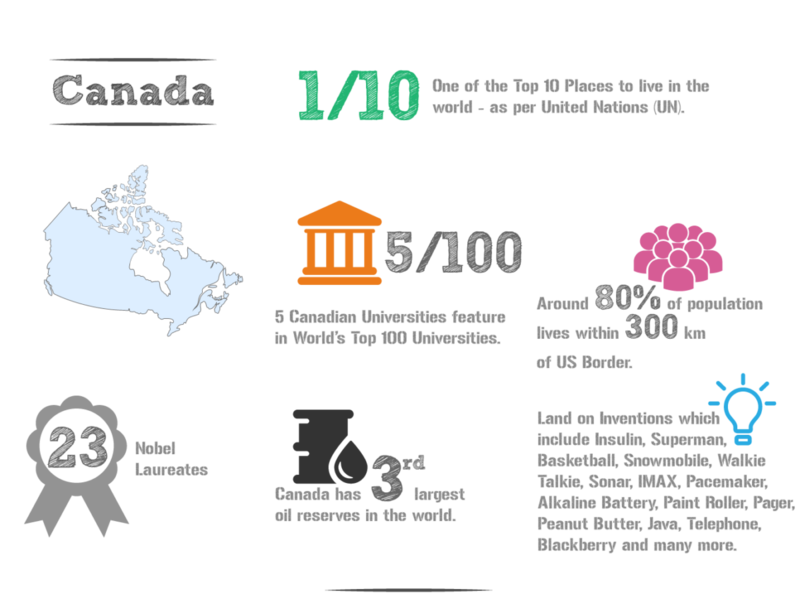 Canada’s universities maintain high standards of academic excellence and are consistently recognized in top international rankings. The country’s universities boast links to more than 5,000 global collaboration agreements. Combined with Canada’s focus on industry-specific applied research, it’s no surprise that more than 90% of Canadian alums are employed less than six months after graduation. High academic rankings and a reputation for friendliness is great, but it’s hard to beat eight consistent years of top rankings by the United Nation as one of the world’s best places to live. 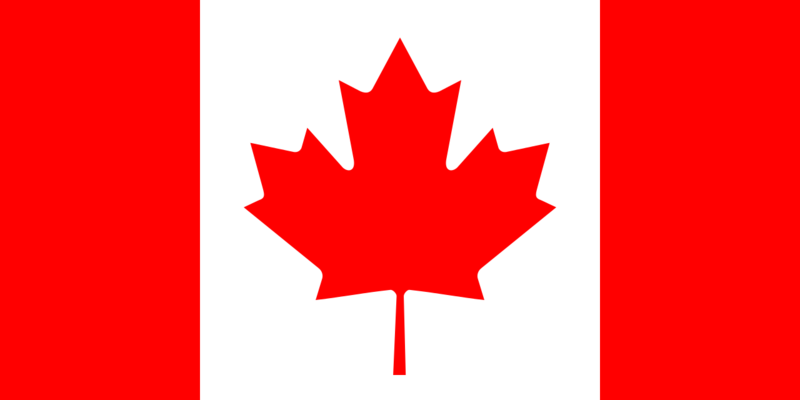 Canada is at the international forefront of computer and information technology, particularly in telecommunications, medical devices, aerospace engineering, lasers, biotechnology, ocean and environmental, and several others. Through its innovative SchoolNet program, Canada was the world’s first country to connect its schools and libraries to the internet. Traditions & Culture: Throughout Canada’s history, its culture has been influenced by European culture and traditions, especially British and French, and by its own indigenous cultures. Over time, elements of the cultures of Canada’simmigrant populations have become incorporated into mainstream Canadian culture. The culture of Canada is a term that embodies the artistic, culinary, literary, humour, musical, political and social elements that are representative of Canada and Canadians. Food: The Most ‘Canadian’ Foods Include Bacon, Poutine And Maple Syrup. The national dish of Canada is a food called poutine, which is a high-calorie creation that consists of fries, cheddar cheese curds and gravy. The Canadian dish was originally seen in the province of Quebec, but can be found all around Canada and has spread to the United Kingdom and United States. Safety: Canada is a friendly, safe country with a high standard of living. Low crime rates, great student health benefits, and universities focused on student security and health make studying in Canada a good choice for anyone who’s uneasy about personal safety while abroad. The Global Peace Index ranks Canada among its top 10 safest countries in the world to visit. Due to Canada’s large size, people often travel between major cities by airplane. All main cities have airports with regularly scheduled flights to and from many places. Canada’s rail network runs across the country, from Halifax, Nova Scotia, in the east to Vancouver and Prince Rupert, British Columbia, in the west. Trains in Canada are safe and comfortable. It is often cheaper to buy train tickets in advance. Catching a bus can be the cheapest way of travelling between cities. It is often the only way of getting to smaller towns if you are not driving a car. Remember that bus travel can be very long due to the great distances involved. In coastal areas of Canada such as British Columbia and the Atlantic region, ferry boats are a common way to travel. Many ferries transport both passengers and vehicles. Canada has a large network of highways, making long distance travel by car possible between most destinations. Bachelor’s Degrees (Universities): 25,000 – 30,000 CAD per annum. Bachelor’s Degrees (Colleges): 20,000 – 25, 000 CAD per annum. Immigration on Arrival: Your passport will be checked when you arrive at a Canadian Airport to make sure you’re allowed to come into the country. It must be valid for the whole of your stay. Off-Campus Shared Apartment or CondominiumOff-campus shared apartments provide students with a single room, in a living space with one or more other roommates. Like townhomes they most often contain a single occupancy bedroom or living space and have a shared kitchen, bathroom, dining, and living room area. Host Family/HomestayLiving with a host family can provide you with a sense of home and security as you start your new life in Canada. Host families normally provide a private, single-occupancy room, and serve one – three meals per day and internet access. Furnished or Unfurnished Apartment RentalsThere are many secure ways to find a temporary furnished apartment rental before your arrival in Canada by using websites such as Airbnb, Craigslist, HouseTrip or Wimdu. These apartments are normally furnished, private rentals. Be sure to read the reviews of each rental and check the feedback from other guests who have previously stayed there. laboratory material containing poultry products/by-products and etc. Opening a bank account: In order to open a Canadian bank account, you will need two documents: one to prove your identity and one to prove your address. This applies both in branch and online. Proving your identity is simple. You just need your passport. What kind of work can you do? There are various part-time jobs available in all the sectors across hospitality/catering to call centre to banking and finance and etc. With few exceptions, it is very unlikely that you will find a part-time job related to your course of study. How many hours can you work? 20 hours per week during studies; 40 hours per week during vacations. Do you need prior approval when you work? No. Some Job searching sites are given below.